Geo Printed Tee is rated 4.8 out of 5 by 12. 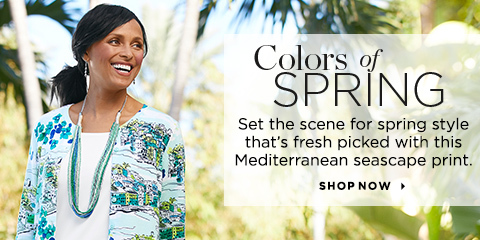 This super-soft burnout tee perfectly combines color and texture to create one eye-catching top. Rated 5 out of 5 by Snaggle- puss from Awesome top I just bought this top today. I am super happy Christopher &Banks decieded to carry different shades of purple this season. I can not wait until the weather changes and I can wear this top!!! Rated 2 out of 5 by Jlmussci from Disappointed I really like the colors and the type of fabric but the neck line is so wide that it slides off my shoulder. I fell very self conscious wearing it. Rated 5 out of 5 by Dar1 from Beautiful colors I love how it fits and the colors are beautiful. It looks really nice with the capris I bought. Rated 5 out of 5 by Bjr73 from Comfortable Love this top, so comfortable and fits great. Love the colors for spring. Rated 5 out of 5 by Nancy72 from Goes great with many things I love this top and it goes with a lot of the other things I have purchased recently. I received many complements when I wore it with the stretchy jeans and a jacket blouse making a great outfit. I love CB as they have so many things that match to make many outfits. Rated 5 out of 5 by dbabr from Very feminine love the colors, very pretty. The best feature is the elbow length "short" sleeves. Covers my fat upper arms! Rated 5 out of 5 by JYB58 from Fun colors! Great fabric- very soft. Awesome spring colors - nice to dress casual with jeans or dress up with a jacket to wear for work. Rated 5 out of 5 by Casual girl 21 from Comfortable Bought this last month. Comfortable top that looks great with jeans, colored demin pants, capris or shorts. Light weight and wears well.